It’s been far too long since Mike and I last checked in, for which we apologize! I’m writing this from the airport terminal at Newark after a whirlwind weekend in the New York City area. Mike and I spoke on Saturday at the Northeast Astronomy Forum, the annual shindig thrown by the Rockland Astronomy Club. It’s unlike anything I’ve ever seen. The exhibit hall in the field house was filled with an eye-watering (wrong expression) display of telescopes and accessories that told me that I haven’t even begun to scratch the surface of amateur astrophotography. We were interviewed on Cosmic Perspective Radio at 9:45 Saturday morning, following their discussion with Pranvera Hyseni, the dynamic force behind the Astronomy Outreach of Kosovo. I had the tough job of speaking immediately after Pranvera at Spacefest last year! Her passion for bringing astronomy education and an observatory to Kosovo are unparalleled. Mike and I spoke at 5:00 in a magnificent venue, in a setting very much like a TED talk. We weren’t sure how many amateur astronomers would be interested in hanging around until the end of the day to hear a talk about the Columbia accident. However, we were gratified by the rapt attention of the large crowd. Once again, we affirmed that the Columbia recovery story is one that the public wants to hear. Afterward, we signed books continuously for more than half an hour. Many thanks to Ken Kremer for inviting us to attend and to the wonderful people at the Rockland Astronomy Club for treating us so well at this event. The next day, we were guests at the Bueller Challenger and Science Center in Paramus, New Jersey. The Challenger Centers are a worldwide network of educational centers that were born from a shared desire by the families of the STS-51L Challenger crew to carry on the crew’s educational mission. We had to shift gears to go from addressing a crowd of astronomers to a group of enthusiastic students and their parents! The kids asked some great questions that often cut right to the heart of some of the major issues facing NASA. We know the future is in good hands when these students eventually take charge. This promises to be another busy week. 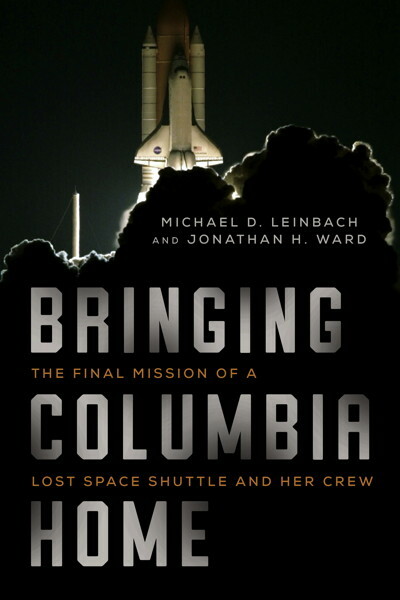 The audiobook of Bringing Columbia Home is scheduled to be released later this week. I had the pleasure of speaking with Danny Campbell, who is narrating the majority of the book. He’s an outstanding actor, and we know he will do wonders with the text. His wife Cassandra will be reading Eileen Collins’ epilogue. Speaking of Eileen Collins, she let us know yesterday that she spoke over the weekend at the Museum of the Southwest in Midland, Texas. She said that the people of Texas sure like the book, and that she signed more than fifty copies after her talk. At 7:00 pm on Thursday, April 26, Ann Micklos will be signing books at the Fairfield (Connecticut) University Bookstore. You all know that Ann’s poignant story was a cornerstone of the very human nature of the events surrounding the loss of Columbia and the investigation of the accident. If you’re in the area, please stop by and meet Ann. I’ll be speaking at the Infinity Science Center in Pearland, Mississippi on Friday for the Space Hipsters (Facebook group) Spring Field Trip. I’m looking forward to meeting many of my online friends face-to-face. We’re also getting a tour of the Michoud Assembly Plant, where the space shuttle’s external tank were built. So you can see that we’re staying very busy sharing the story of Columbia and the amazing efforts of so many people to bring her home again. Stay tuned for more news soon! Audio Book Coming April 24! It’s hard to believe that it is less than two months since Bringing Columbia Home was “officially” released. The book’s momentum continues to be very strong, as evidenced by both sales data as well as the feedback we’re receiving from readers. We learned this week that the book is going into its third printing! Pre-orders were so strong that the second print run was ordered before the book even officially went on sale in January. Sales stats show that it’s selling well all over the country, not just in areas near NASA centers. We feel that is an indication that people from all walks of life are seeing this as an American success story. Audiobook set for release next month! Tantor Media will be releasing the audio version of Bringing Columbia Home on April 24! Pre-orders are available at Tantor’s website. Danny Campbell and Cassandra Campbell are the voice actors who are reading the book. Danny was the reader for the audio version of Gene Kranz’s Failure Is Not an Option. Cassandra Campbell has recorded nearly 200 audiobooks and has one many awards for her narration. We are confident that this amazing team will do a great job with the book. The book is getting rave reviews on Amazon.com, and Mike and I are grateful for the feedback that people are leaving for us on the website, on Amazon, and also the private emails that people have sent us. Since my son was Cdr Willie McCool, this book had a special meaning for me. Additional closure and an account on the events while I was in Houston during the recovery efforts. I give it 5 Stars plus. I found myself in tears more than once as the tale unfolds. This book makes me proud to be an American all over again. And we also had some feedback from astronaut Scott Kelly! In ‘Bringing Columbia Home,’ Mike Leinbach and Jonathan Ward have vividly captured the intensity of those very difficult days. They tell the story with compassion but without pulling any punches. The book also reminded me of the spirit of the American people who selflessly worked together to help NASA in its hour of greatest need. It’s a message we all need to remember these days. If the book moved you as it has moved these other readers, we of course would be grateful for your spreading the word to your friends and colleagues. A positive review on Amazon is also very helpful for encouraging other people to read the book. NASA Safety Days, Kennedy Space Center: Mike will be delivering two talks at KSC the week of March 12 as part of NASA’s Safety Days observances. NASA Alumni League – Florida Chapter: Mike will be the guest speaker and will be signing books at the NAL’s meeting at 11:00 on March 20 at the Debus Center at the KSC Visitor Complex. The event is sold out! Next week’s blog update will include information on our public appearances the rest of this spring and summer. Author Jonathan WardPosted on March 11, 2018 Categories Book, Public EventsTags #skyhorse, #tantoraudio3 Comments on Audio Book Coming April 24! Closing out the Book Launch – Part I! Wow, what a rush! I can’t believe how energizing—and exhausting—the past four weeks on the road have been! And that was on top of the month spent preparing for the book’s rollout. You may have heard that marketing a book is harder work than writing a book. I will tell you from first-hand experience that it’s true. Recall that Mike and I met in St. Augustine, Florida on December 18 and 19, where we signed 350 books and mailed more than 200 of them to people who had placed pre-orders. The other 100 copies went out in the mail over the course of the next several weeks. Our official book launch tour started off with our talk at the George W. Bush Presidential Center in Dallas on January 16. We followed that with events in the Kennedy Space Center area on January 25, 26, and 27. Then it was on to Houston and Mike’s panel discussion on January 31. We drove to Hemphill that afternoon and spent a deeply moving couple of days with the people who had worked so hard to search for Columbia‘s crew and to support the NASA family after the accident. Signing our books in Hemphill’s Remembering Columbia museum on the 15th anniversary of the accident was the culmination of all that we had been working for over the past three years. Then it was back to Houston for another talk on February 3. We had a couple of days back at home to recover, and then it was on to Virginia for our events at the Smithsonian’s National Air and Space Museum on February 11 and 12. Our final events for this tour were on February 15. First was a talk and book signing at lunchtime at the OSB2 building, for KSC employees. We had time for a quick bite afterward at Crackerjacks in Titusville before heading to our next stop—a presentation and signing at The Great Outdoors, an RV and golf resort west of Titusville. We had a packed house of very attentive people who asked a lot of great questions! Our final event was a celebratory dinner at Zarella’s Italian restaurant in Cape Canaveral. We were joined by retired CNN reporter John Zarella (his sons own the restaurant) and several members of the Space Hipsters Facebook community. John is a larger-than-life personality, and he entertained us with many behind-the-scenes tales of shenanigans at Kennedy Space Center. It was the perfect celebration and a wonderful way to end a very, very tiring month on the road. Numbers, of course, don’t tell the real story. I have more than enough fond memories from this trip to last a lifetime. Witnessing a tearful hug between Belinda Gay and one of the NASA men who searched for Columbia in the Hemphill area. Meeting the spouses of some of Columbia‘s crew. Introducing Mike to the heroes of the recovery operations. Having friends and family on hand for the National Air and Space Museum interview. Seeing the good people of East Texas smile with delight at receiving their copy of the book containing their stories. Hanging out with Greg Cohrs and his family. Sharing the legacy of Columbia and her crew with people who had no prior knowledge of the scope of the recovery operations. Receiving so many expressions of thanks and encouragement. And not least, spending countless hours with The People’s Launch Director, who I am honored to call my friend and colleague. This is just the end of Part I. We’ll have more appearances in the coming months. And there are exciting things in the works! Author Jonathan WardPosted on February 19, 2018 Categories Book, Public EventsTags #skyhorse #nasm #smithsonianLeave a comment on Closing out the Book Launch – Part I! Mike and I were invited to speak at the Smithsonian’s National Air and Space Museum (NASM) on February 12. While I always feel honored to speak to groups, this venue held a special place in my heart. I worked as a volunteer tour guide at the NASM back in the summers of 1971 and 1972, while I was a student in high school. I can’t tell you how excited I was to be back again in the capacity of a subject matter expert! We began our Washington, DC weekend with a signing at the Smithsonian’s Udvar-Hazy Center in Chantilly, Virginia, on Sunday, February 11. The Udvar-Hazy Center’s vast hangar holds planes and space vehicles that are too large to display in a more traditional museum. Here you’ll find everything from a World War I “Spad” to the B-29 Enola Gay that dropped the Hiroshima bomb to a Concorde SST to an SR-71 to the space shuttle Discovery! Mike and I walked around Discovery before our book signing. Mike remarked that the last time he stood under Discovery, she was still radiating heat from re-entry. That was after the conclusion of the STS-133 mission on March 9, 2011. I was fascinated to hear Mike point out several things that I might not have otherwise noticed. For example, take a look at the discolored streaks marked by the arrows in the photo below. Those give you an indication of the angle of attack—how steeply “nose-up” the space shuttle flies when it is re-entering the atmosphere. Mike also pointed out to me some of the newer, high-density “FRCI” insulation tiles on various spots along the orbiter. These newer-technology tiles replaced some tiles along the orbiter’s belly and under its wings. You can see some of them in the photo above, as they are darker black than the older tiles. I never cease to be amazed at how large a vehcile the space shuttle orbiter was—and Mike points out that it was the smallest part of the shuttle “stack” at launch. It’s doubly hard to imagine that a one-pound piece of foam could bring down such a mighty ship, as it did with Columbia. As a longtime resident of Northern Virginia, before I moved to North Carolina seven years ago, I really enjoyed seeing many friends of mine who came by to say hi at the museum. My son and daughter also brought their families to share the day with me. My middle granddaughter Samantha wore her astronaut garb and she fit right in! My family! My wife Jane and me; granddaughters Molly (pink coat), astronaut Samantha, and baby Charlotte; my daughter Rosey (dark coat) and her husband Jason; and my son Ken (blue shirt) and his wife Valerie. And Mike off in the corner, hopelessly outnumbered. That night, we met for dinner with former shuttle commander Pam Melroy and Robert Hanley of NASA. Pam was in charge of the Columbia crew module reconstruction effort back in 2003, and she was instrumental in writing the crew survivability report that was key to several important equipment redesigns for future crewed spacecraft. Robert was a member of the Vehicle Integration Test Team in 2003, and he also played a very important role in the crew module reconstruction. Both Pam and Robert were key contributors for Bringing Columbia Home, and although I’d spoken with them extensively on the phone, I’d never met them in person. Astronauts always have tons of wonderful stories to relate! I was thrilled to hear Pam give us some peaks behind the scenes of what it was like to work as a “Cape Crusader” to prepare shuttles for other crews, as well as her own experiences during missions. For example, she said that you get used to making very small and very slow movements when you’re in zero-G; she said you could always tell who the rookie astronauts were because they were covered with bruises after the first day or two. But it was critical for the shuttle’s commander and pilot to prepare for the larger, more forceful actions that would be needed to control the shuttle during reentry. So the pilots had a hand controller hooked to a laptop that enabled them to simulate the actual hand and arm motions required for reentry and landing beginning a day before the end of the mission. Pam said she really needed that reminder, because she blew the first simulated landing! Pam also mentioned that she always had a particularly hard time adjusting from zero-G back to Earth’s gravity. It was doubly hard for her when she had to fly the shuttle back home as commander when “my gyros were pegged” and she felt physically awful from the transition back to gravity. Robert had been the personal interface between Columbia‘s crew and the vehicle team on the ground at Kennedy. He shared some wonderful reminiscences—touching and funny—of his time with the crew of STS-107. Not looking too bad, considering we had just spent 3-1/2 hours eating, drinking, and talking at Maggiano’s! Mike, “Pambo,” Robert, and me. Monday, February 12 was our day at the NASM’s main building on Independence Avenue in Washington, DC. We were hosted by Dr. Valerie Neal, chair of the Smithsonian’s Space History Department and curator of the NASM’s space artifacts. Mike taped a brief segment with Marty Kelsey for the Smithsonian’s STEM-in-30 program, talking about how the slidewire escape system worked at the launch pad. Mike also taped a short segment for middle school students about his educational and career path and what he liked about his job. Then it was time for the “What’s New in Aerospace?” program, hosted by Dr. Neal. I can’t describe for you how amazing it felt to be in that wonderful space, with my family in the front row of the audience—and my guidance counselor from high school sitting right behind them! I hadn’t seen her in person for 35 years, but we have kept in touch since 1974. She was instrumental in helping me sort out my educational path when I was a confused teenager, and even after I went off to college. It was such an honor to have her there to share the culmination of my life’s work (so far). Mike flashes a “thumbs up” to a colleague just before we go live. I can’t believe how fast the program time flew by. Dr. Neal’s easygoing demeanor made this feel much more like a conversation with a friend than a presentation to a worldwide audience. It seemed like we were just scratching the surface of our stories about the recovery effort, and suddenly we saw the PA holding up a sign that it was 2:28 pm, meaning the show was only supposed to go another two minutes longer! There was so much more we wanted to talk about, but no time in which to do it. Afterward, we learned that over 3,600 people had watched the program on Facebook Live! And the recording of the show is now posted here for your viewing pleasure. I should also point out that the Smithsonian asked us to write a blog post for their website about the Columbia accident and its aftermath, and you can find it at this link. After the signing, we met up with former Shuttle Test Director Al Sofge and his wife Suzanne, a retired director from NOAA. Mike, his wife Charlotte, and Al and Suzanne shared a lot of laughs about the life of a test director during the shuttle program. Mike noted that Al was notorious for walking so briskly through the hallways that he created a gust of wind when he strode by. People gave the strength of that wind gust the unit of measure “1 Al.” If he was in a hurry for something particularly important, he might create a gust of 1.2 Al or even 1.4 Al! We also talked about the recent SpaceX Falcon Heavy launch and possible paths that NASA and the commercial crew companies might take. All too quickly, our time in DC was over. We said our goodbyes at our hotel in Virginia this morning, and laughed when we said—seriously—”See you tomorrow in Florida!” We have two more signings on Thursday, February 15 in the KSC area. What a whirlwind this past week has been! Mike and I finished the final events (*so far) of the Texas portion of our book tour this week. We drove back from Hemphill on Friday morning, to be greeted by a Texas-sized traffic slowdown on I-10 near Baytown as we rushed to reach our noon appointment at Johnson Space Center. We were only a few minutes late meeting Lori Wheaton of JSC External Affairs who whisked us away to the Sonny Carter neutral buoyancy lab north of JSC. The size of the facility defies description. The pool is so deep (40 feet) that the water make it appear that the bottom is curved in a concave vault shape! The size of the modules in the water showed just how large the International Space Station really is, and how hard it must have been for the astronauts fo We arrived just after a training session. Two people walked by us wearing astronaut cooling garments, and we saw technicians preparing one of the astronaut EVA suits to be carted away. Back at Johnson, we set up in Building 3’s cafeteria for a book signing starting at 3:00 p.m. It was an unusual time for them to host a signing, as the employee store normally closes at 3:00, and this being a Friday, it was uncertain just how many employees would want to come by. Much to our surprise and relief, we had quite a turnout. More than 80 people had books signed. Many people told us about their personal experiences with the search and recovery effort. Signing the book for JSC employees. On Saturday, I took advantage of a generous offer that Tracy Lamm of Space Center Houston to take me around the visitor center before our scheduled presentation. I enjoyed seeing “the other Columbia,” the Command Module from Apollo 11, in the central part of the main room. Tracy also took me out to the Shuttle Carrier Aircraft and the Space Shuttle. I hadn’t been inside the SCA before, and I had forgotten just how big a 747 is inside! I was particularly impressed with the video about the gentleman who used radio controlled airplanes to model how the SCA would have to perform in order to lift the shuttle. I had the rare good fortune to have a quiet meal with Tom Jones in the conference room in between two of Tom’s appearances that day. Tom had just finished an in-depth reading of “Bringing Columbia Home.” I was flattered that he had so many nice things to say about the book and the anecdotes that had most impressed him. Tom’s always been one of my favorite astronauts, and I feel so lucky that I’ve gotten to know him over the years since we used to run into each other at one of our favorite hangouts, Cafe Sano in Reston. Mike arrived after lunch. Tracy took Mike around for a short tour. While they were in the Apollo 11 exhibit, I ran into Belinda Gay, who was attending the Space Exploration Educators Conference (SEEC) at the space center. While I was talking to her, Rene Arriens also came by. Rene was on the closeout crew in the shuttle White Room. He was also a searcher in Sabine County during the Columbia recovery. He’d never met Belinda before. When he started to recall his experiences in Sabine County, his emotions began to bubble to the surface. It didn’t help that I told him that Belinda had been responsible for the meals he ate in Hemphill’s VFW hall. The two of them shared a tearful hug. What a powerful moment that was, and I felt privileged to witness it. Educators and the public begin arriving at the Space Center Theatre for our talk. Mike and I delivered our presentation to the SEEC as the keynote speakers for the last day. We were in an IMAX-size theater, and they had opened it up to any visitors who wanted to attend. Our audience was therefore a mix of educators and the public. But everyone seemed very interested in what we had to say about that remarkable time in history. Mike and I pointed out Belinda in the audience when we talked about the volunteer effort, and she got a big round of applause. We had some great questions, such as how educators might petition to use Columbia debris in the classroom. Mike encouraged them to submit applications. I concluded with a few comments about the divisive mood of the country during the accident recovery, and that if we could put differences aside then, we could certainly do so now to accomplish important work. After the talk, we signed books in front of the gift shop. In the course of 1-1/2 hours, we signed more than 120 books for some very enthusiastic educators. I met several fellow Solar System Ambassadors, which I enjoyed very much. Many families also came through. One young fellow at the end asked for advice on how to become an astronomer. He thought I was an astronaut! I set him straight—but I did feel compelled to show him some photos from my zero-G flight in 2016! And so concluded the Texas leg(s) of our book tour. What a magical time it’s been. I have really enjoyed the enthusiastic reception the book has gotten, and it’s been a real thrill to meet so many interested people. I heard a lot of stories about what it was like to witness the accident and live through the aftermath. It all just goes to deepen my respect for the people who took part in this incredible time in our nation’s history. Mike and I fly to our respective homes on Monday to catch our breath and relax in familiar surroundings. But we’ll be back on the road later on in the week. We’ll be signing books at the Smithsonian’s Udvar-Hazy Center in Chantilly, Virginia next Sunday (February 11) from 12:00-3:00. Our presentation at the NASM in downtown Washington, DC will be on Monday, February 12 from 2:00-2:30. Scott Kelly wants you to buy our book! I’m at a loss to describe what an incredibly powerful day we had in Hemphill, Texas, on this the fifteenth anniversary of the Columbia accident. We spent Wednesday night at the Fin and Feather Resort on the Toledo Bend Reservoir six miles south of Hemphill. (This was the base for Navy salvage operations during the Columbia recovery.) The Sabine County Memorial Committee threw a nice Texas-style party for us in the resort’s convention center that evening. Thursday morning began at a 7:45 service at Hemphill’s First Baptist Church. The service included a remembrance of the crew of STS-107 and the two men who perished during the recovery effort. Following that were tributes to the people of East Texas delivered by NASA officials: Gerry Schumann, who worked for four months in the recovery in Hemphill; Sean O’Keefe, former Administrator of NASA; Mike Leinbach, former Shuttle Launch Director; Ellen Ochoa, Director of Johnson Space Center; and Bill Gerstenmaier, Associate Administrator for Human Exploration and Operations. All reiterated the undying gratitude that NASA feels to the people of Texas—and thousands of Americans from across the country—who labored so selflessly to find Columbia’s crew and recover the evidence that enabled NASA to return the space shuttle fleet to flight. The spouses of four of Columbia’s crew were on hand during the service: Evelyn Husband Thompson, widow of commander Rick Husband; Sandy Anderson, widow of mission specialist Michael Anderson; Jean-Pierre “J. P.” Harrison, husband of Kalpana “KC” Chawla; and Jonathan Clark, husband of mission specialist Laurel Clark. I had the honor of meeting and talking with all four of them after the service. They all asked Mike and me to sign copies of the book for them, and J.P. also took a copy of the book for Lani McCool. We drove over to the museum, uncertain whether there would be any books there for us to sign! A delay in the second printing led to a late shipment of the books from the distributor. Belinda Gay rode herd on our publisher all week. As of the evening of January 31, it appeared that the shipment had not left the distribution center. Just before the memorial service started, Belinda told me that she had heard that one box of books had left Shreveport bound for Nacogdoches overnight. She had dispatched someone to intercept the shipment when it arrived at Nacogdoches at 9 a.m. and to drive the box directly to the museum. It was only going to be 24 books, but combined with the 10 books our agent brought us in Houston on Wednesday, it would be better than nothing. For some reason, I was too stupid or too trusting or too much of a Pollyanna to believe that there would ever be a problem with getting the books to Hemphill on the day of the anniversary. I just couldn’t let that possibility enter my mind. I just smiled and waited. We started signing at 10:00 and kept going for two hours without a pause. Some people brought with them six or more copies of the book that they had purchased from Amazon for family and friends. Many people had books signed for their children and grandchildren. All were genuinely thrilled that we had chosen to tell the story of the miraculous deeds of the people in this corner of the world. And they were justifiably proud of their contributions to the recovery. And I enjoyed seeing that many of them had signed each other’s books, too. What a fantastic way to connect! It was a joy to meet these wonderful folks, shake their hands, have our picture taken with them, and hear their stories of how the Columbia accident affected them. As Mike and I kept signing books, we wondered where they were all coming from! It turned out that the other three boxes of books that Belinda ordered showed up unexpectedly. The museum now had ninety books for sale. Everyone who wanted a book got one. And the museum made a lot of money from the sales. It felt like the miracle of the loaves and fishes. I also believe it is due to the hard work Belinda put into tracking down those shipments, and the efforts that the staff at Skyhorse Publishing put into making this possible. I’m grateful that it worked out so perfectly, and I thank everyone who worked so hard on our behalf. The end result was a LOT of happy people in Hemphill and two very happy authors. The Tyler, Texas TV station interviewed Mike and me briefly, and then we went to lunch at the church’s family center. You wouldn’t believe the spread of food contributed by the townspeople. You could have had just one teaspoon of food from each of the dishes and still overflowed your plate. We left from the church for a side trip to two very special sites near town. The first is the “nose cone site,” the place where Columbia’s nose cap came to Earth. The large rounded piece of reinforced carbon-carbon and some supporting structure had crashed through the trees and created a small crater in the forest floor. The US Forest Service helped NASA removed the wreckage from the site, and the piece now resides in the Columbia Preservation Office at Kennedy Space Center. A few PVC pipes mark the perimeter of the indentation that still exists, 15 years later. The Sabine County Memorial Committee has been trying for years to purchase the land to turn the site into a memorial grove. Hopes are high that it can happen sometime in the next couple of years. We then visited the American Hero site, where the first remains of a Columbia crew member were found on February 1, 2003, barely an hour after the accident. It’s a touching reminder of the reverence with which the community still regards Columbia’s crew. We returned to the museum, where Mike graciously helped judge a robotics competition amongst area high schools. After another TV interview, our day wrapped up at about four o’clock. I drove Mike and Jane by the VFW hall outside town, so they could see the place that served as the command center in Sabine County during the recovery. It’s hard to imagine now the days when there were police cruisers parked more than one quarter mile along the road leading to the hall every morning. We had a few beers to celebrate and unwind in the bar overlooking the lake. The day was such a whirlwind that it’s difficult to take it all in. My predominant emotion is unadulterated joy at being back here on the anniversary, as I promised to Marsha and Belinda two years ago, with a book that celebrates Columbia and the people who brought her home. There’s a sense of pride in a mission accomplished. I feel tremendous love for these wonderful people who have enfolded us in such a warm embrace. I’m delighted that Mike was able to make the trip and make this connection, too. It’s fantastic to see folks again. Sheriff Maddox told me that I have a “get out of jail free” any time I’m in town. Marie “Little Grannie” Nelson brought us banana bread. Jan Amen made us Smoky the Bear dish cloths! 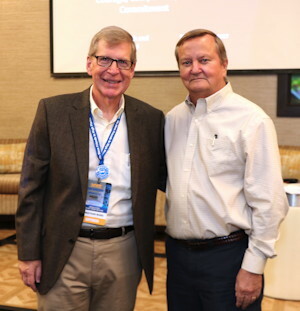 Don Eddings, Don Iles, Mike Alexander, Olen Bean, Roger Gay, Jamie Sowell, and so many others—how great to catch up with you. And Marsha Cooper and Belinda Gay…what more can you say about two women who have kept the memory and magic of that time alive? I’m deeply grateful to you as always. Thank you. My heart goes out to Greg Cohrs, who received word during the memorial service that his mother had passed away. Now February 1 will mark two times when Greg’s life changed forever. Greg, I’m deeply sorry for your loss. We are headed back to Houston again tomorrow for the last leg of our Texas trip. I know we’ll be back here in Hemphill again. Today I’m sharing the last of the three videos I produced in January as a tribute to the final crew of Columbia. Bringing Columbia Home: STS-107 Recovery, Reconstruction, and Return to Flight: This eight and one-half minute video centers on rarely-seen EPA and NASA footage of the debris recovery operations in East Texas, activities inside the reconstruction hangar at Kennedy Space Center, and America’s return to manned spaceflight in the STS-114 mission of July 2006. The melancholy mood of the debris search becomes more determined during the investigation and finally ends on a triumphant note as STS-114 successfully completes its mission. Please be aware that the video shows scenes of some of the wrecked pieces of Columbia as they were found on the ground in East Texas and as they appeared in the reconstruction hangar. It is presented in a tasteful manner, but it may provoke strong emotional responses in some people. On this day, the fifteenth anniversary of the accident, please pause to thank the Columbia crew for their sacrifice in the name of exploration. Also please thank the people of East Texas and the US who brought meaning to the loss of the ship and her crew by gathering the evidence needed to allow the Space Shuttle program to fly again. Order your personalized, autographed copy of the book today! Bringing Columbia Home Powered by WordPress.com.